What is a geek, nerd, and dork? Okay, there is a lot of discussion in the inter-webs about the difference between a geek, a nerd, and a dork (and dweeb for completeness’ sake). I happen to think that the differences are based on the way our ear has been trained to hear them, and that’s due to the personal experience of the listener and regional differences. However, I came across this diagram some years back, and I now use it to clarify my use of the terms. 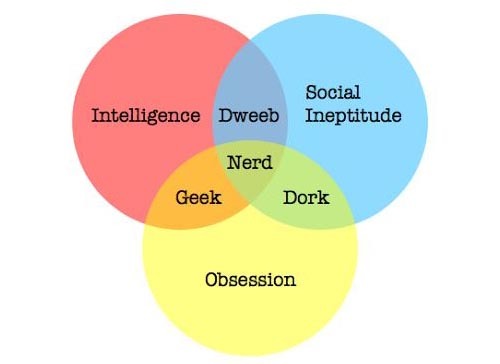 I have a high enough opinion of my social skills to believe I fit into the geek category rather than the nerd, dork, or dweeb categories (and, of course, I’m an engineer who LOVES Venn diagrams). The attitudes towards each of these labels has been changing over the years. With the undeniable success of some high profile geek/nerd/dork/dweebs the terms have been subject to the same sort of “reclaim the terminology” fervor that I’ve seen in the younger feminist movement (and other movements as well, I just have more multi-generational experience with the feminists). As I’ve watched the younger generations of geeks claim their culture with unreserved pride, I’ve taken to thinking of myself as an “elder geek” and will talk about this more in future posts. For now, I want to clarify how I’ll be using these terms and where I identify in the whole universe of fandom.